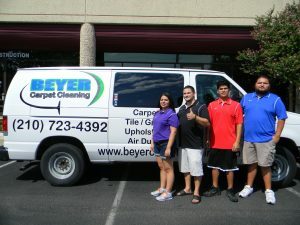 Beyer Carpet Cleaning San Antonio is a safe and reputable carpet cleaning company in San Antonio. Beyer Carpet Cleaning is a family owned and operated carpet cleaning company so we always put our customers first. When a customer calls Beyer Carpet Cleaning they will hear a friendly voice. All carpet cleaning information is disclosed up front over the phone. There are no surprise fees or price changes when one Beyer’s carpet cleaning technicians arrive to your home. Carpet cleaners San Antonio have a reputation of having hidden charges or changing prices upon completing a carpet cleaning job. Beyer Carpet Cleaning is true to their word and does not do this. Carpet cleaners in San Antonio will not just take you for your money but they will more than likely do a horrible carpet cleaning. We encourage our customers to read our online reviews on Yahoo, Google, YP, Foursquare, Kudzu, and Facebook. This way they know they are not only dealing with a professional carpet cleaner but a safe and reputable carpet cleaning company. We do not swindle or bait and switch our customers. Beyer Carpet Cleaning only hires technicians who have clean backgrounds and who have family, friendly personalities. If Beyer Carpet Cleaning would not trust someone to be around their family they certainly would not want them to be around your family. There are many carpet cleaners in San Antonio that you can call to clean your carpets but not all of them will be honest or up front with you. There are many carpet cleaners that say you can trust them and their work but are they safe and reputable carpet cleaning? Always be sure a carpet cleaning company has a valid website, customer reviews, and rankings. Beyer Carpet Cleaning has all these things that is why we are a safe and reputable carpet cleaning establishment.